HOUSTON (AP) — Miami Dolphins coach Adam Gase couldn’t hide his irritation with the team’s defense after a 42-23 loss to the Houston Texans on Thursday night. “We’ve got to get better fast,” he said. 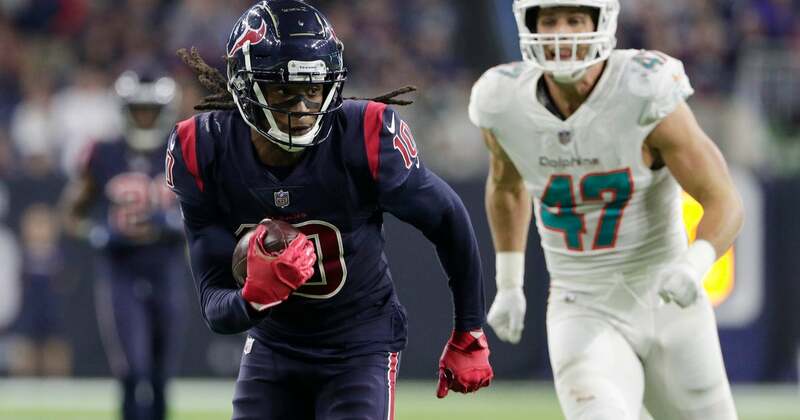 The Dolphins allowed a season high in points on a night Texans quarterback Deshaun Watson matched a career best with five touchdown passes, including ones of 73 and 49 yards. “They try to get everything patched up as fast as possible,” Gase said of the staff. “These guys were hired because I liked them when we were coming into the situation we were in. I trusted Matt to get this thing going in the right direction. Miami’s rush defense, which entered the week ranked 29th in the NFL by allowing 136.7 yards a game, allowed Houston another 188 rushing yards on 5.4 yards per carry. Former Dolphins running back Lamar Miller had 133 rushing yards on 18 carries, including a 2-yard touchdown run. Linebacker Cameron Wake, a five-time Pro Bowler, defended Burke, saying: “He’s good,” and placed most of the blame on player performance. After a 3-0 start to the season with wins over the Titans, Jets and Raiders, the Dolphins have slumped to fall to 4-4. With starting quarterback Ryan Tannehill still sidelined with a shoulder injury, the Dolphins turned to Brock Osweiler for a third straight game. In his return to Houston, where he spent one season, Osweiler completed 21 of 37 passes for 241 yards, no touchdowns and an interception. Receiver DeVante Parker had 134 yards on six catches. After Thursday’s loss, Gase said he didn’t know if Tannehill would be healthy in time for Miami’s next game on Nov. 4 against the Jets and that he’d worry about that next week.